» Other News » Attending to a growing concern…. Attending to a growing concern…. 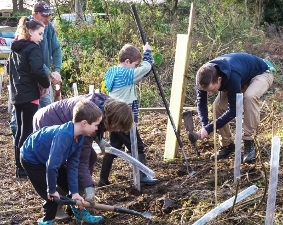 ARMED with spades, hoes and pick axes, welly-clad Pyrford residents of all ages gave up their time on Saturday to get down and dirty to create a living local memorial to commemorate the First World War. Even their pet dogs came along to show their support for the living memorial. 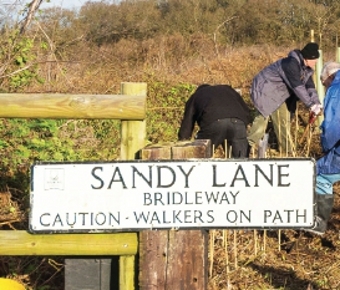 If all grows well, a total of 1,300 various trees will form the village’s ‘Great Hedge’ along a 250-metre stretch of Sandy Lane Bridleway. 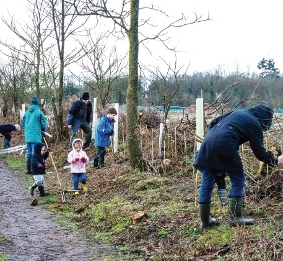 It is one of a number of such initiatives launched by The Woodland Trust for the Great War centenary, including planting new forests and hedgerows. 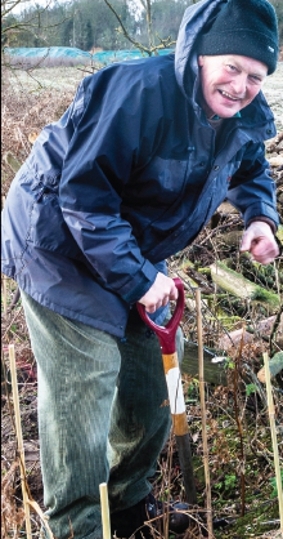 Pyrford Neighbourhood Forum’s Open Spaces Co-ordinator, Carole Gale, approached the land owners, Burhill Estates, who agreed to participate in the project, while different sections of the community offered to help with the planting. The Woodland Trust funded more than half the trees, while Burhill paid for the remainder, also supplying labour to prepare the ground. The trees were chosen by the trust to provide food and shelter for – and to entice – local wildlife. The mix includes hawthorn, blackthorn, hazel, field maple, crabapple, dogwood, dog rose and oak, and Burhill have agreed to maintain the hedge. The oaks will be planted at regular intervals and, being planted at the top of an escarpment, will stand as a proud reminder of the many villagers who gave their lives for their country and whose names are inscribed on the war memorial outside St Nicholas’ Church in the village. Carole said: “I am very proud to be taking part in this initiative. It is great to see the community coming together to create this living memorial to those who gave their lives in the First World War. “We are really very grateful to The Woodland Trust and Burhill Estates for making this project possible. Rachel Kirk of Burhill worked especially hard to make it all happen.